suspect and fugitive: a fugitive on the new yorker blog!! a fugitive on the new yorker blog!! hi again, readers! i have some exciting news this morning! (well, ok, to me it's *very* exciting! to you it may be "meh".) 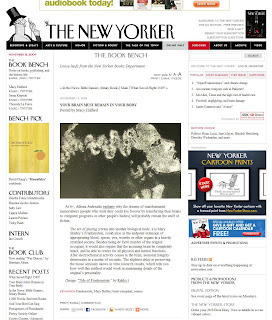 "tide of frankenstein" was used in macy halford's transhumanist embodiment critique "your brain must remain in your body" on the new yorker's "book bench" page! i'm totally dying over here!